Food Sovereignty offers itself as a process of building social movements and empowering peoples to organise their societies in ways that transcend the neoliberal vision of a world of commodities, markets and selfish economic actors. There is no one-size-fits-all solution to the myriad of complex problems we face in today’s world. Instead, Food Sovereignty is a process that adapts to the people and places where it is put in practice. Food Sovereignty means solidarity, not competition, and building a fairer world from the bottom up. Food is a fundamental need – access to food is essential to human survival and a basic human right. In our current society we see both a disregard for this right on one hand and a taking for granted of it on the other – for many in the overdeveloped world food seems abundant, yet that abundance rests on the fragile structures of a highly damaging and controlled food and agriculture system. Food is also political – the production of, access to and distribution of food are essential for our society to function and control of our food system. Political forces have worked for many years to control all aspects of food production systems and bring the cycle of food production, from seeds, inputs, land and other necessities under centralized and increasingly privatized control. 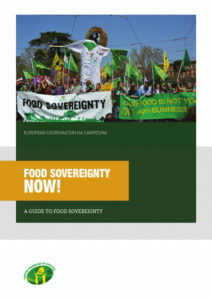 In the publication, the European Coordination Via Campesina delivers a thorough account of the concept of Food Sovereignty, an approach and process developed by the people most threatened by the processes of the consolidation of power in food and agricultural systems: peasant farmers. Instead of being destroyed by the forces of history they are offering a proposal to solve the multiple crises which humanity is facing.